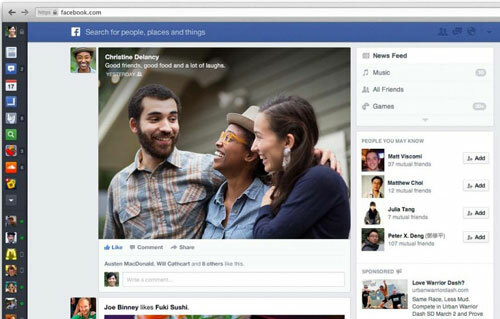 By now, you have heard that Facebook is going through a major homepage overhaul. It will change the way you will use the social sharing website because it will change the way people will interact with the center component of Facebook, the News Feed. Everything happens in the News Feed. It is “prime real estate” and Facebook knows it. As CEO Mark Zuckerberg said in the announcement, he wants to give users the “best personalized newspaper in the world”. What that means to social marketers is he is going to make it harder for us to get our clients seen on the News Feed because he wants users to “personalize” it. That personalization could mean not wanting to see posts from business pages even though that person “liked” the page. This is the New Facebook Layout – Photos front and center! The choice of different feeds is where social marketers are going to have to work harder to get their clients seen on Facebook. Right now, 30% of your News Feed is content from business pages. With the change, users will be able to choose what is in their main news feed and, for the most part, they are going to choose their friends over a business. How will your business be seen? When fans “like”, comment or share posts from a business page. But, how will that happen if the business isn’t on the main News Feed? Photos. The second most important feed channel will be the Photos Feed. Facebook is gambling that users will not only want to see their main “friends” on their News Feed but also see content in the Photos Feed. If businesses are posting photos with status updates, then your fans will see that on the Photos Feed. If it gets shared from there, it will appear on the regular “friends” News Feed. It basically boils down to content…again. If you engage your fans with powerful content, they will share that with friends and, in turn, your message will be seen. If you think just posting an update about a sale at your store or a funny quote will work, be prepared to lose the social media marketing war that is heating up very, very quickly.